In 1897 she died there, and again I remember the American Flag in red, white and blue flowers which covered the coffin, sent by "Doctor McComas." Many members of the family have died at 79 Alder Street, the little daughter of Dr. Edward Lloyd Howard and Laura Maynard Howard first, in 1894. Since then, Mrs. McHenry Howard in 1908, McHenry Howard in 1923, and their daughter May Howard in 1943. A very deep love for Oakland and Garrett County is born into, and inherited by, all the descendants of Francis Scott Key, who have spent their summers at 79 Alder Street, and though for the past two years the present writer is the only member of the family to get there, and that, in all too short a stay, yet it is always with a deep sense of homecoming, of belonging in great part to Garrett County, that I return. This is an artists sketch of a Summer Home in the Glades of Garrett furnished to TABLELAND TRAILS by the Baltimore and Ohio Railroad. The artists were Lederer and Davies. The etching was made in the 1880's. The base and first floor were of solid masonry of native stone. From the second floor upwards it was of wood with shingle and scrolled finish. There is much speculation as to where this house was built and who occupied it. The editor ventures a guess that it was the residence of Henry Brobst of the North Glades. A description of this house is to be found in "A Sporting Family of the Old South" by Harry Worcester Smith, lately of Albany, New York. ** Reprinted from "The Glades Star" with permission of Miss Julia Howard. 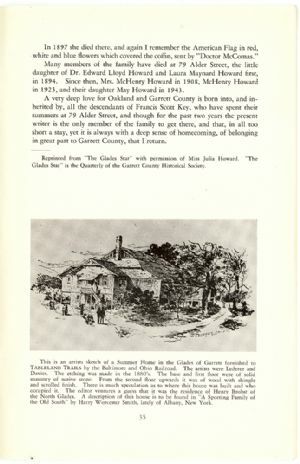 "The Glades Star" is the Quarterly of the Garrett County Historical Society.